=> It uses real-time visualization to view the organs and the fetus. => It does not rely on ionizing radiation, which is harmful to the embryo. => Ultrasound imaging is interactive because the operator can capture numerous viewing planes by maneuvering the probe. => Ultrasound technology today enables healthcare practitioners to view internal images in 2D, 3D, 4D and even 5D. It is the traditional ultrasound scanning. It means the probe sends and receives ultrasound frequency waves in one plane. Waves which are reflected back are black-and-white images of the fetus in a flat plane. The ultrasound transducer Toshiba is moved across the stomach to enable numerous viewing planes. When the correct plane is found, as indicated by the image produced on the monitor, a still photography is captured and developed on film. An example of a 2D ultrasound machine is Medison X6, Siemens X150, Edan DUS60. Innovation in transducer technology has improved visualization of abnormal and normal anatomy contrast resolution including a bi-directional Doppler flow which enables enhanced vascular study. You can even look for GE Voluson portable ultrasound machine to add convenience to your medical profession. More advanced development of imaging technology has promoted volume data or differing two-dimensional images which are created by reflected waves at angles which differ from one another. High-speed computing software then integrates this information to create a 3D image. GE’s Volusion I creates 3D ultrasound images by combining image volume data acquisition, volume display and volume data analysis. The operator obtains volume data by, freely moving the probe with or without using position sensors, relying on mechanical sensors that are built into the probe and using matrix sensors. Data is displayed in a rendered image, tomographic mode or multi-planar format. The multi-planar format enables the operator to assess multiple 2D image planes simultaneously. => Virtual planes enable enhanced visualization of fetal heart structures. => Better diagnosis of fetal face, skeletal and neural tube defects. => This technology helps to identify structural congenital anomalies in the 18-20 week scan. => Reduced time for standard plane visualization. => Less dependence on operator’s experience and skill for diagnosing fetal anomalies. => Recorded data is available for remote viewing. This ultrasound technology enables live streaming of 3D images. In other words, patients can view the live motion of the fetal valves, heart wall blood flow, etc. 4D ultrasound technology is 3D ultrasound in motion. A 3D transducer is utilized. 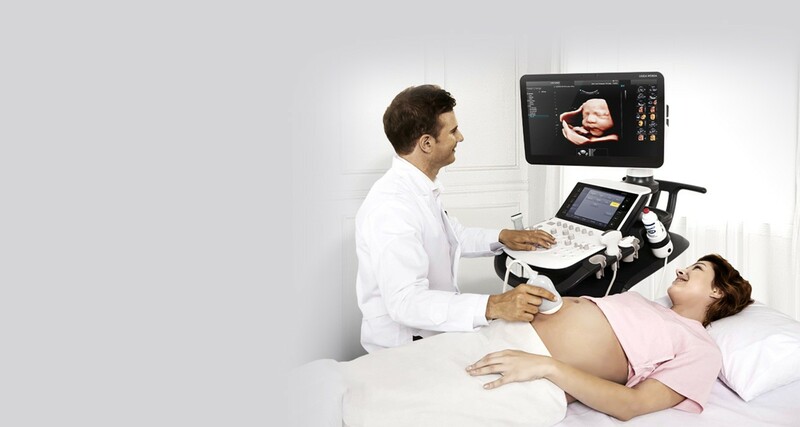 GE’sVoluson E10 4D ultrasound machine enables you to see moving images of the various organs in the fetus. Currently, its clinical applications are still under investigation. Most people seek 4D ultrasounds for keepsake videos, a practice which is currently discouraged by some medical watchdogs. Currently, Samsung is the main player in the 5D ultrasound technology arena. Their ultrasound portfolio includes the Samsung WS80A Elite. 2D ultrasound captures axial images, whereas 3D relies on volume. 4D images combine volume and time while 5D attempts to bring a new level of workflow, which borders on automation. Samsung entered the ultrasound arena after considering which exams are very time-consuming. They wanted to identify ways to assist sonographers with this process. 5D ultrasound technologies is a type of automation where you undergo a scan, and the results are auto-populated for you. The operator will receive assistance in getting more complex exams done, or the entire examination itself is semi-automated. Both should significantly improve workflow. Eventually, consistency will also improve because the process of searching through volume to locate data and how measurements are conducted is standardized. Currently, the practice is more evidence based. Samsung’s Elite performance 5D heart application packages enable the operator to create nine standard fetal cardiac views all at once. It will help to relieve the pressure of screening and diagnosing congenital heart disease, which is a leading organ-specific defect. Samsung’sWS80A includes features such as 5D NT or nuchal translucency and 5D LB or fetal long bone. Samsung’s Elite performance package combines 5D Heart and 5D CNS aimed at the central nervous system. It displays 6 measurements which are BPD, OFD, HC, Posterior Fossa, Cerebellum, Atria lateral ventricle from 3 transverse views. Samsung’s Ws80A Elite performance package has currently received a 510(k) clearance. It debuted in the U.S. at the 35th Annual Meeting for the Society for Maternal Fetal Medicine.